This bottle had been kicking around my beer fridge for quite some time and I finally decided to open. I have no idea where I purchased it or how old it was but fortunately the beer held up quite well. Chatoe Rogue First Growth is a series of beers from Rogue using ingredients grown on their farm. There are several others still available but this one was retired a while back. Beautiful deep red color with a tan head. Aroma has a mix of dark fruit and malt. Taste starts quite sweet and then turns a bit tart with the cherries. The cherry taste is not very prominent which makes this beer a lot more enjoyable than other super sweet cherry flavored beers I have had. 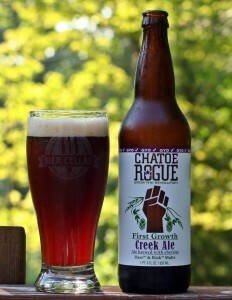 Overall this was an enjoyable beer from Rogue but not something I would seek out again. Brewers Description: We made this beer with our own hops and barley. Malty aroma, dark mahogany-brown in color with a rich, malty sweetness that finishes dry on top of a lush cherry flavor.